Due to the upgrade of the accessories, the metal strap and the plastic strap buckles will be shipped randomly. 1. HD Photos or Videos and PIR function: the camouflage digital trail camera can be triggered by sudden change of ambient temperature caused by any movement of human or animals in a certain region of interested, which is detected by a high sensitive Passive Infra-Red (PIR) sensor (PIR up to 60°detection angle and night vision up to 65ft), and then captures pictures (highest to 16MP), or records HD video (1280*720P) clips and save into SD card(support up to 32 GB) automatically. 2. 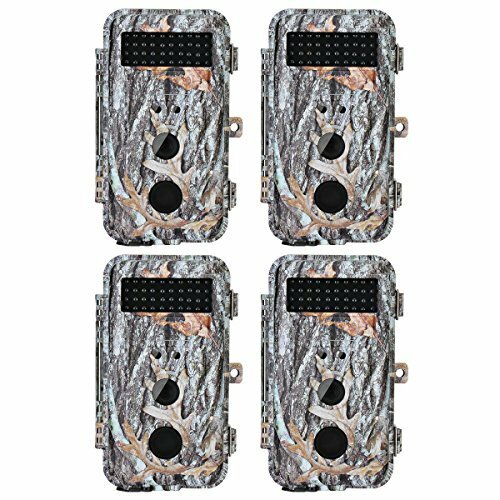 Stealth design and energy saving: Camo design makes the camera stealth and ideal for outdoor animals scouting, home security surveillance or office monitoring. And the operating temperature is between -22 ~ + 158 ° F/-30 ~ + 70° C. Long in-field battery life (in standby mode, up to 3 - 6 months with 8*AA batteries and Auto power off in 10 minutes while no keypad controlling). 3. Interesting Time lapse feature: the game hunting camera automatically and constantly takes pictures/videos at specified interval in this feature. It's very useful when observing cold-blooded animals like snakes, or the process of plants or flowering, birds building nest, or when monitoring unattended properties such as parking or yards. This feature can be used together with Timer feature to meet your timetable. If you have any questions about this product by BlazeVideo, contact us by completing and submitting the form below. If you are looking for a specif part number, please include it with your message.